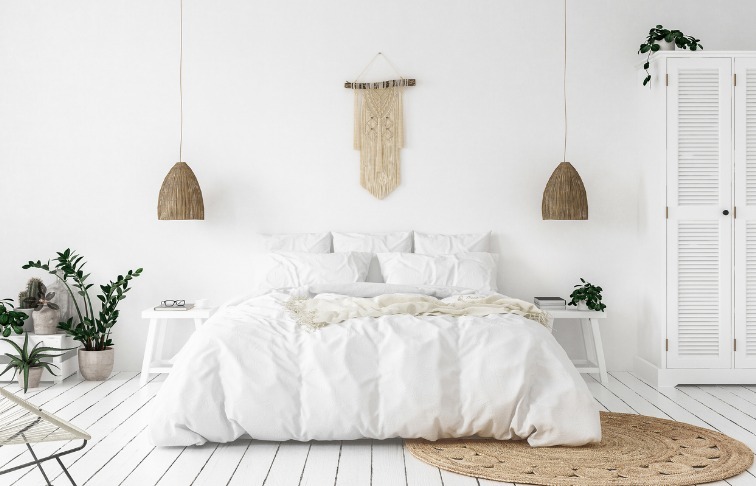 With 2019 well underway, we are seeing bedroom style trends that draw on influences from a number of different eras ranging from the 1980s, 1970s and even Art Deco styles. Bedrooms are following these trends but are also becoming more warm, inviting and sanctuary-like overall. Your bedroom is a room that is receiving special treatment to make it ultra relaxing. This theme runs through all the elements of bedroom furniture, fabrics, lighting and wall treatments. Let’s start with the largest furniture item in the room. This year we’re seeing more interest in bedrooms becoming more of a sanctuary, an oasis where you can relax as though you live in a luxury resort. Four post beds set the scene for an ultra–relaxed experience, cuddling you in thinner and thicker designs to suit your taste. Add canopies for an ultra–inviting home to sleep. With a new year of home trends come new fabrics, and bedrooms are taking full advantage of it. With a full range of bold and soft colors, bedrooms are becoming more a place to comfortably relax, and the textures reflect it. We’re seeing more interest in thick wools, velvets, silks, and other luxurious materials that are designed to wrap you and put you in a dream state. We’re seeing more fabrics on headboards and footboards for an ultra–soft feel. The new trend toward BoHo design is creating an appreciation for more natural beauty and handcrafted designs. And in this style, the whole range is present. From antique styles to more rustic, simple styles, we’re seeing an emphasis on pieces that are more individual and special, even telling a special story in its design and use of materials. Finish the look with art pieces, lighting, and artwork. Wallpaper continues to excel in creating atmosphere, and a bedroom is an ideal place for it. The new styles range from colored florals to bolder solids and geometric designs to suit your taste. New technology is providing more 3-dimensional textures, coating your room in padded luxury. The trend in gold, metal and other natural elements are easily added in your bedroom through wallpaper’s leafed treatments, adding rich texture. Combine nightstands in silver handles with lamps of gold, and add in more metal accessories to the mix. We are now seeing a bolder mix of metals. Not everything is matching, making pieces stand out more to be appreciated individually. In some cases, the past trends in neutrals made bedrooms appear a bit matchy, but the new trend is to make each piece unique, and color is an excellent way to do it. Like mixing metals, colors are now brought together for visual interest and to slow the eye down, bringing more appreciation to your room and each piece in it. And what is a more comfortable place to appreciate the designs in your home than in the relaxed setting of your bedroom?